The BroadConnect Hosted Call Center solution expands the capabilities of legacy call centres by allowing call centre agents to be geographically distributed. Agents can take calls from home, a satellite office or from mobile handsets with our Hosted Phone Systems. Our ACD feature set includes hunt groups, call queuing, and no-answer treatments coupled with Auto Attendants that route callers properly. Looking for World-Class Call Center Services? You have come to the right place, BroadConnect has what you want. Like each of our great solutions, this service is available on a monthly fee basis, enabling small to midsized businesses access to next generation ACD and reporting tools, without the added expense of hardware. Our Hosted Contact Center service has an affordable monthly fee structure, allows small and mid-sized enterprises to access advanced ACD and reporting capabilities, without the high capital costs of an on-site solution. Enterprises can define ACD groups that best utilise their resources, instead of having to define ACD groups around physical locations. Define skill groups that include agents from any site, or include mobile users in ACD groups. Linear Call Distribution – Agents are visited in order, always starting with the same agent. Circular/Rotary Call Distribution – Agents are visited in order, starting where the last hunt ended. Uniform Call Distribution – Calls are distributed uniformly to the agents, starting with the agent who is the idlest. Simultaneous Call Distribution – Calls are presented to all idle agents simultaneously. Weighted Call Distribution – Calls are randomly distributed to agents according to a configurable weight. Directory Number Hunting – This enables call waiting for agents, and incoming calls are re-routed to ACD if agents are busy or not available. Geographical Routing – This is call distribution at a single site and call distribution at multiple sites. ACD State – Indicate your availability through the desktop, web portal, or IP phone interface. Hoteling for Extension Mobility – Agents can log in at any available workstation/phone while maintaining unique user settings. Overflow (Call Forwarding Busy [CFB]) – Incoming calls can be forwarded to an overflow phone number when the queue is overloaded. Night Mode Overflow – Overflow goes to a designated destination/phone number when no agents are available. After Hour Policies can be set through Selective Call Forwarding [SCF] Feature. Holiday Routing – Route calls to the appropriate people during Holiday periods. Music On Hold (MOH) when agents are busy. Configurable queue length and scalability of queue size. Send the call back in the queue if Call Center is not staffed. Agent Join/Unjoin – Calls are only presented to agents who are on duty, and agents can join into multiple Call Centers’ queues. Queue Transfer – An agent can transfer a call back into the queue (at the front or back position). The total wait time is preserved and captured as reporting averages. Voice Messaging – Each ACD has a voice-messaging box where callers can leave messages for agents to process later. Queue Flushing/Escape to Voice Mail – When all group Call Center Agents log out, queued calls are automatically sent to a Call Center group voice mail. Basic and Enhanced Call Logs are available with this business telephone service. Hosted Call Center users have access to ACD queuing functionality, which can be enhanced with the ability to set the ACD state (i.e. sign-in/out, available/unavailable, wrap-up) through a web portal or their phone. This is the power of an IP Telephony solution. 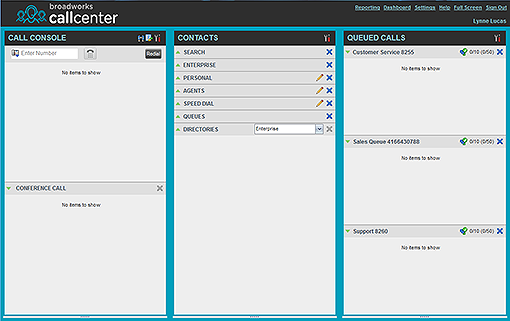 A sophisticated desktop client application is also available and it provides integrated call control, click-to-dial, and ACD state management functions. The Agent and Supervisor desktop clients allow users in higher volume call centers to quickly and efficiently manage and receive calls when being serviced by one of the strongest VoIP SIP providers in Canada. 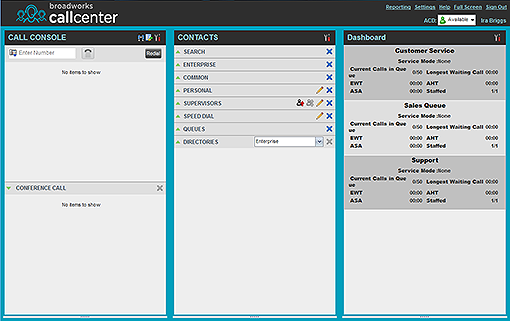 The Call Center Agent desktop client enhances their productivity through intuitive interfaces that let call center agents answer, redirect and resolve calls more quickly to increase productivity and improve the caller’s satisfaction level. To future-proof your offer, BroadWorks supports both audio and video for services like music/ video on hold, entrance announcements, and comfort announcements while delivering high VoIP call quality. Using the Supervisor desktop client, customers are able to monitor real-time agent and queue activity, manage incoming calls, and generate in-depth historical reports.